The national news has been chaotic lately, to say the least. It can be hard to know how to talk to your children about what’s going on, for a number of reasons. The themes are complicated and confusing, the news is changing quickly, and even we grown-ups are struggling to make sense of what’s happening. Some of us are also triggered by what’s happening, which can make it even more challenging to know how to talk about it in age-appropriate ways with our children. Despite all of this, it’s important to talk to your kids about what’s happening in a way that works for you and your family. Not only is it an important part of their education and development, but they may hear bits and pieces (which may or may not be accurate) from other children at school or the news or a variety of other places. Talking to your children about all of this will help ensure they get accurate information and it will help them make sense of what’s happening. 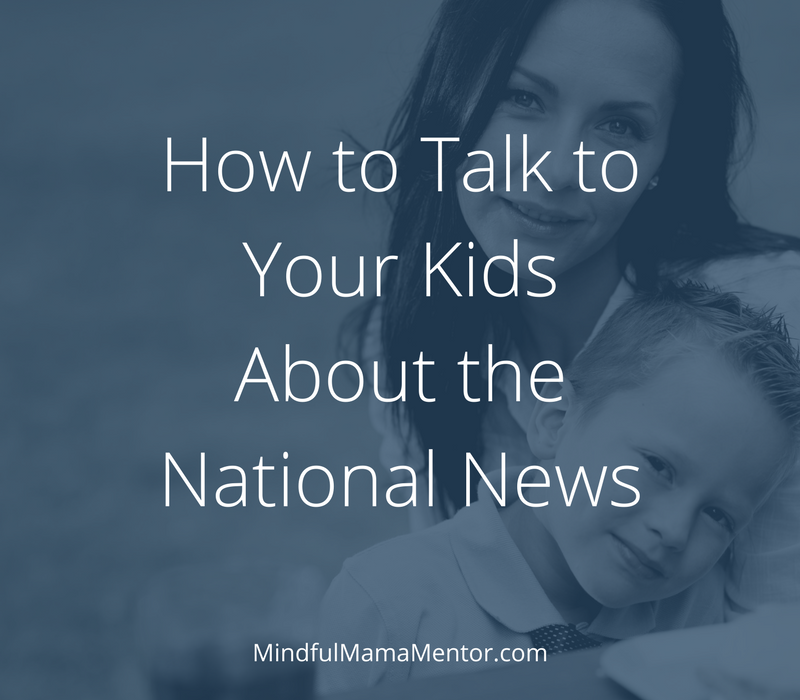 Find ways to introduce the important themes to your children apart from the news. For example, in the wake of Charlottesville and other relevant events, you may want to read your kids books or watch movies with them that introduce ideas about difference and diversity. There are a ton of ways to have these conversations and it’s important to find ones that work for you and your family. Ground yourself before you have the conversation. The news can be quite upsetting, so it’s important to get yourself grounded and calm before you dive into difficult topics with your kiddos. If they raise a question at an inconvenient time or place, thank them for bringing it up, let them know that it’s an important topic that you want to discuss, and let them know that you will talk about it later. Just don’t forget to come back to it! Remember that you don’t have to have all the answers. It’s ok to tell your children when you don’t know or aren’t sure about something. When possible and appropriate, look it up together. Or find ways to get the information on your own and share it with them later. You can also let them know that some of this is confusing for everyone, and that’s ok too. The important thing is to let your children know that these topics are important and worth discussing, even when you don’t have the answers. Don’t flood them with information. We adults have a tremendous amount of information, memories, worries, and possibilities floating around in our minds, much of which may come to the surface in the course of these conversations. Your children don’t need all of that. Listen carefully to the questions they are asking, and answer those questions as honestly, directly, and clearly as you can without diving into too many extraneous details. Don’t try to reinvent the wheel. Educators, clinicians, librarians, and researchers across the country are working hard to figure out the most effective ways for parents to introduce this information to their children. Talk to them, do some research online, check out books from the library. Talk to your friends and other parents in your community. This is tough stuff, and support will make it easier. Remember that the ability to introduce your children to these topics in calm and thoughtful ways is a privilege. Many children across this country and world learn about racism, anti-semitism, bigotry, and violence through their lived experience in ways that are deeply frightening and unsafe. Those of us who are fortunate to not have to worry about such realities absolutely have a responsibility to continue the conversation and teach our children about these important issues. Carla Naumburg, PhD, is a clinical social worker and writer. You can learn more about her work at www.carlanaumburg.com.